Adoption is a celebration, a welcome new addition to the family. It should be a time of joy and happiness. You want someone knowledgeable and caring to handle this special area of law in Nevada for you. We at the Steinberg Law Group are skilled Las Vegas adoption lawyers in handling all potential consequences and developments that can arise in the process of an adoption. We handle stepparent, grandparent and extended family member adoption. Many adoptions involve extensive paperwork and may place you at risk of legal complications. The final prove up hearing must be done correctly as well. Otherwise, the Court might not grant the adoption. We understand that this may be a confusing process so we take special care to resolve adoptions in Las Vegas and other locations in Clark County, Nevada as quickly as possible while doing everything possible to minimize or eliminate the problems inherent in this process. We are a knowledgeable and professional adoption law office that have helped to resolve many cases quickly, successfully and without any trouble. Our adoption lawyers can assist with stepparents, registered domestic partners and other family members who can adopt the children of their spouse or registered domestic partner. After the adoption is finalized, the adopting parent has the same rights to the child as the biological parent. A termination of the parental rights of the biological parent(s) might also be necessary prior to proceeding with an adoption. 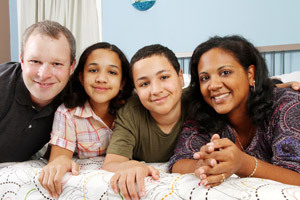 Our group of professional adoption attorneys Las Vegas experts are able to help you with your case. Please contact us for more information about your particular situation. If one or more biological parents are alive, a Termination of Parental Rights (“TPR) action is necessary prior to an Adoption action. Often, it might be difficult to locate one or more of the living biological parents. A publication might be necessary for this purpose. If a biological parent is found and contests the TPR, then the Court will set an Evidentiary Hearing (similar to a trial) to determine if a TPR is warranted. There is a VERY high burden that must be met to TPR of a parent. This requires legal skill and experience and should not be attempted without first hiring an attorney, as the litigant requesting TPR will likely not get a second chance. Even if the biological parent agrees to TPR, then an attorney should be hired for the “prove up” hearing which is very specific to place the necessary legal evidence into the record sufficient for the Court to grant the TPR. If this is not done right at the prove up hearing, then the Court might deny the TPR which could be a terrible tragedy for the minor child at issue and the litigant seeking custody of to adopt the minor child. It is heartbreaking to hear the stories of prior litigants who had a great case but did not hire an attorney to get the job done right. It is a shame for the children who need stability and to remain with the person who has acted in a parental capacity and to possibly be adopted by someone who will be a permanent parent to the minor child. Hiring a qualified and experienced attorney can make all the difference in the world.